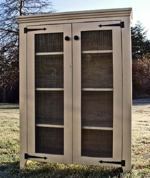 While the designer calls this a garden cabinet, it could easily be used indoors as a display cabinet. Build it using these free downloadable woodworking plans. This DIY Jelly Cupboard Plan features a shelves behind doors and primitive styling. Free simple step by step plans to build your own.